No doubt that the overwhelming theme through all of the comments was time. More time with loved ones, time with kids, time with spouses, we all want to spend more time with the people we love! 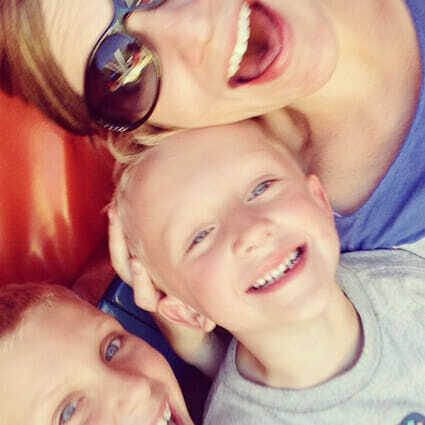 Me with a couple of my kiddos on a tilt-a-whirl mid-ride! That was my own goal when I posted that and since then I’ve honestly made a conscious effort to spend more quality time connecting with my kids this summer. That doesn’t mean we have to spend hours participating in structured educational activities. It can mean being lazy, but being lazy together! 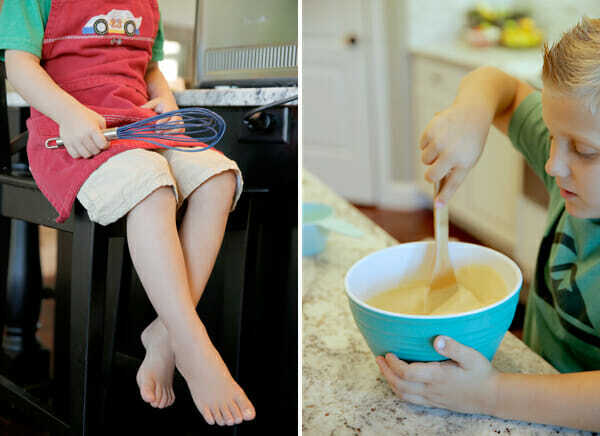 We jump on the tramp, we go on bike rides, and we do one of our favorite things: cook. Most of you know I’m pregnant right now, with my 4th boy. People say to me all the time, “You need a little girl, so you can have a little helper in the kitchen!” I totally get where they’re coming from, but what they don’t know is that I have three awesome helpers already. My boys love to help and be involved, (especially when it’s something like ice cream.) I’ve been doing this cooking gig for their entire lives, so they’ve grown up being a part of it and I hope their future wives appreciate that! When we’re all home during the summer I like to let them pick special kitchen projects that we can do together. They helped design this ice cream flavor! This is a custard-based ice cream, meaning it starts with a cooked mixture involving egg yolks. Don’t worry- the eggs are cooked! 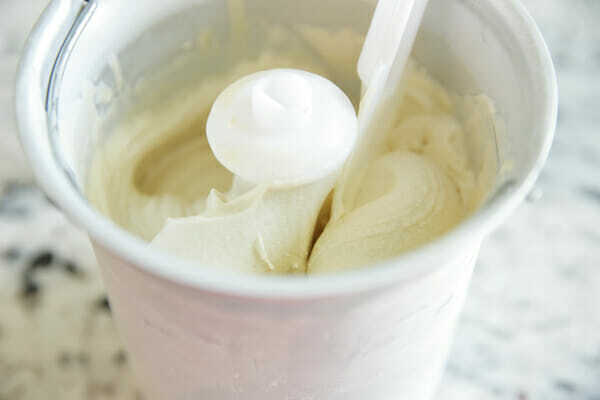 Custard-based ice creams are incredibly creamy and extra silky smooth, so although they take a little more effort than a quick mix-and-freeze style ice cream, the payoff is grand. Also, I kind of love prepping it all the day before and having more time (like, 25% more!) to relax the next day and just pop it in the ice cream maker. Start by combing some whole milk, whipping cream, and sugar, on the stove top. You’ll want to heat it gently, so as not to scorch the dairy, so use a rubber spatula and stir pretty constantly. While that’s heating, separate 4 egg yolks into a bowl (you can use the whites for something else- make an omelet!). The next step is to temper the eggs, meaning to bring them up to temperature. If you drop egg yolks into a simmering liquid, they would scramble, so instead, take a ladle and slowly drizzle a small stream of the hot milk mixture into the eggs, while constantly whisking. 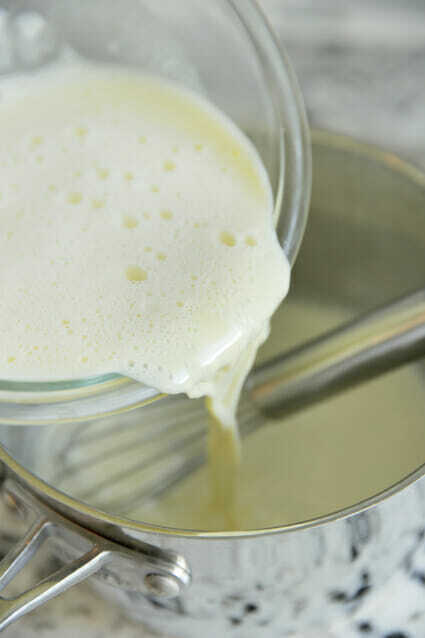 Once you’ve transferred about half of the milk mixture into the eggs, it should be warm enough and now you can add the egg mixture back into the pot. Continue cooking until the mixture registers about 170 degrees. If you don’t have a thermometer, the mixture will thicken slightly and when you dip a spoon into it, you should be able to run your finger over the back of the spoon and leave a “track”. When the mixture is up to temperature, we’ll add the peanutty goodness. Just use regular ol’ creamy store-bought peanut butter here. I don’t recommend getting fancy and using homemade or natural style peanut butters. Take the milk mixture off the heat and immediately stir in a little peanut butter. The heat will make it easy to whisk it right in. Once mixed in, strain through a fine mesh strainer (just to make sure there aren’t any scrambled egg or sugar bits) and let it cool completely. Then pop it in the fridge over night. The next day you can freeze in an ice cream maker according to the directions. 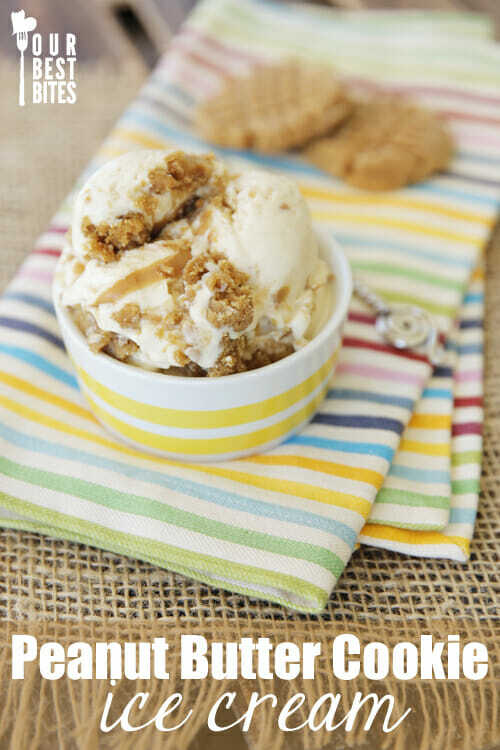 While your ice cream is churning, break up some peanut butter cookies. 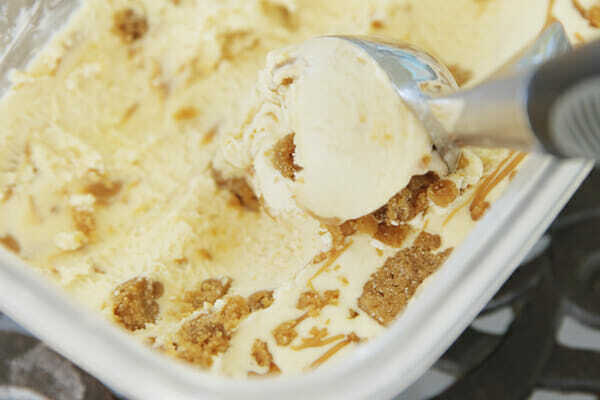 I use this super quick and easy recipe, that I made the day before when I prepped my ice cream. When I put cookies in ice cream, I like to under-bake them so they stay nice and soft. And while we’re throwing delicious things into homemade ice cream, let me just say that any peanut butter-chocolatey thing would be delicious in here. 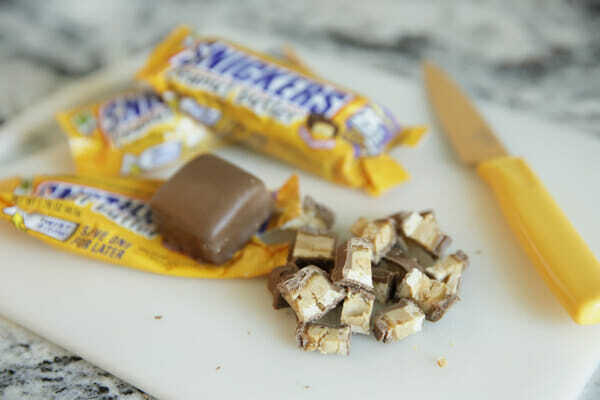 I cut up some Snickers Peanut Butter Squares, because ya know, that can only be a good thing. 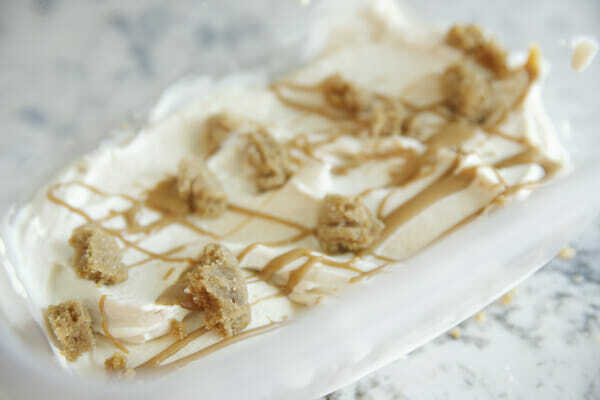 My kiddos loved them sprinkled on top, and the soft nougat and peanut butter layers went perfectly with the ice cream. This ice cream will be smooth and creamy, and as you can see it’s just a light golden color and has a nice mild peanut butter flavor. 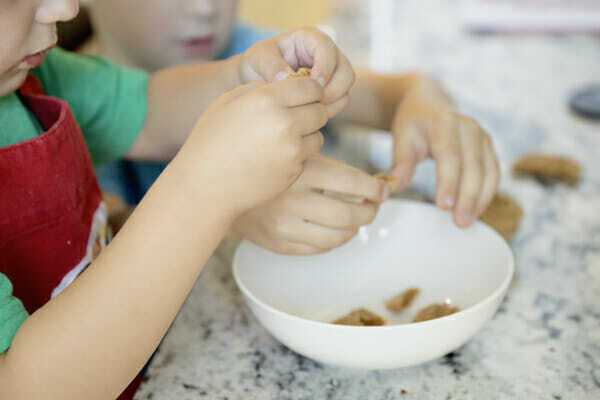 We wanted ours to have a yummy peanut butter ribbon, so I softened a little creamy peanut butter in the microwave until it was stirable. Frozen peanut butter has a perfect texture, so you don’t need to add anything to it. You can hand mix your cookies into the ice cream, or just sprinkle them in like I did. 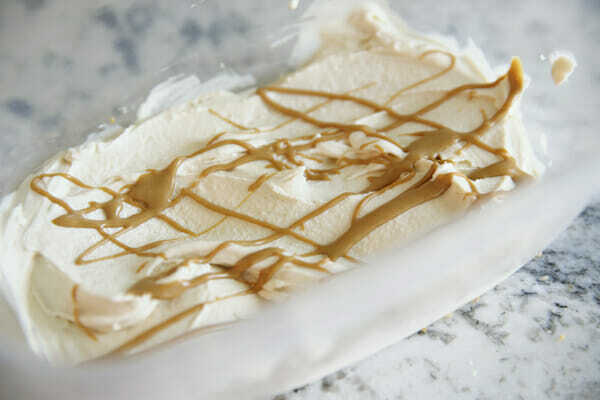 Start layering your ice cream in a freezer safe container and drizzle on a little peanut butter. Sprinkle in cookies (or candies if you want) and continue until everything is used. Pop the container in the freezer until it’s firmed up (that usually requires at least 3-4 hours) and then dig in. You know how sometimes homemade ice cream can be a little icy? And turn rock hard after sitting in the freezer? This one is insanely rich and creamy and has a perfect texture. Or save your cookies for the outside instead of the inside. 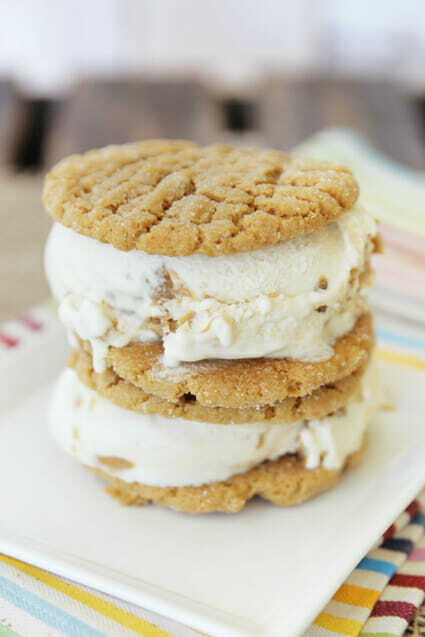 This makes amazing peanut butter cookie sandwiches. 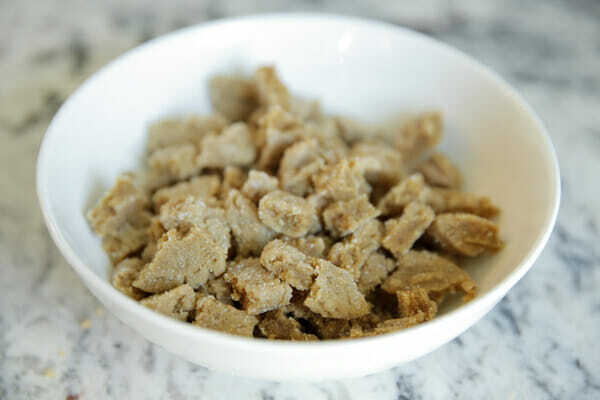 Any way the cookie crumbles, this will be a new favorite in your house- I can almost guarantee it! 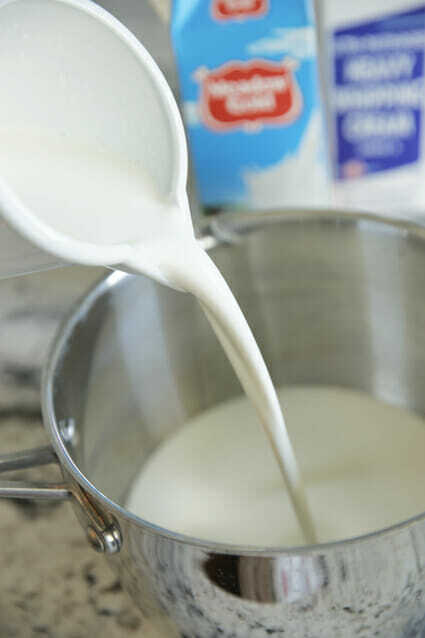 In a large saucepan, combine milk, cream, and sugar. Over medium-low heat, stirring very frequently, heat the mixture until bubbles form around the edges, and then remove pan from heat. While the mixture is heating, whisk egg yolks in a mixing bowl. 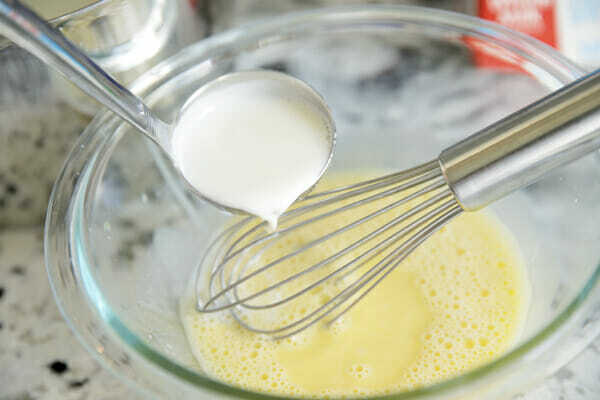 After you’ve removed the cream mixture from heat, slowly drizzle the hot milk mixture (I suggest using a ladle, or a measuring cup with a spout) into the eggs while whisking constantly. 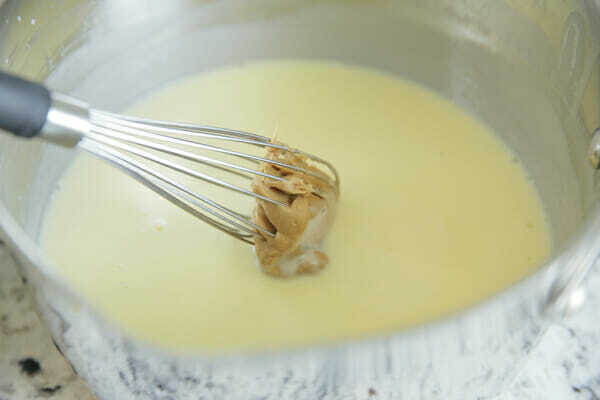 If you add the cream mixture too quickly the eggs will scramble, so just do a little at a time. This process warms the egg yolks gently so you can move on to the next step. 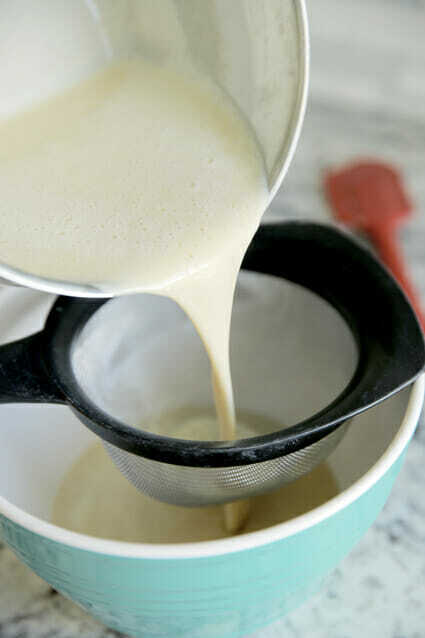 After you’ve added about a cup of the hot milk mixture, return the pan with the milk mixture to medium-low heat and slowly whisk in the egg mixture. Heat, stirring constantly, until thickened–it’s ready when you dip the back of a spoon into the mixture and, when you drag your finger through it, it leaves a trail. If you have a thermometer, shoot for about 170 degrees, and don’t go past 175. Remove the pan from heat and add X cups peanut butter, stirring/whisking/mashing until it is melted and incorporated. Let mixture cool until barely luke warm. You can transfer mixture to a separate bowl, or an ice bath, to speed up that process. Then cover and chill in the fridge overnight. 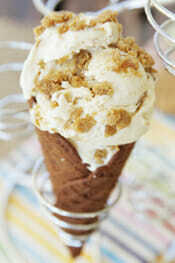 Once chilled, process in ice cream maker according to manufacturers instructions. 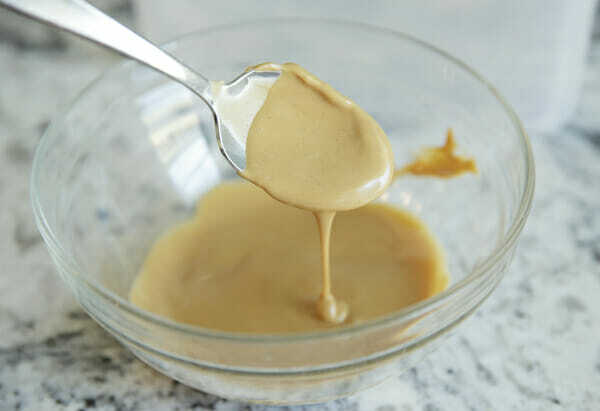 When ice cream is nearing completion, place remaining 3 tablespoons peanut butter in a bowl and heat in microwave until just melted enough to drizzle (but not hot), about 20-30 seconds. 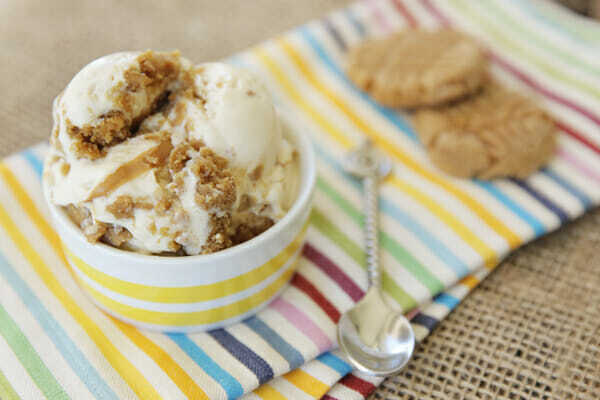 When ice cream is finished, gently stir in cookies by hand. 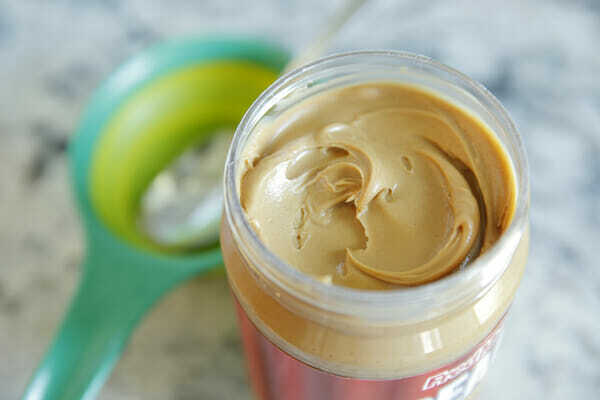 Layer into a freezer safe container, adding drizzles of the softened peanut butter as you go. Smooth out top, cover, and freeze until firm enough to scoop. If desired, serve with additional candies or cookies on top. I wish I was one of your friends that got to sample your concoctions! This looks amazing! Mmmm! is 8:35 a.m. too early to eat ice cream? It sounds delicious. And it inspires so many ideas. Our Costco used to sell a caramel almond toffee ice cream that was my favorite and I bet I could re-create it exactly the same way you did this one. If it works, you will be my new best friend. This sounds amazing! I made the strawberry cheesecake ice cream last weekend for company because it was quick and easy, but this sounds like it’s worth the extra time…. Oh, goodness, if I could count the times someone said that I needed a girl. Or asked if we’re going to try for a girl. 🙁 We also have three boys, and they are all amazing helpers and love being in the kitchen! Yay for little boys!! Haha, part of the gig that comes with being a boy mom, right?? Thanks for the recipe Sara, loved the pictures. And thanks for featuring my comment. I STILL need 25% more self-confidence, working on it!!! 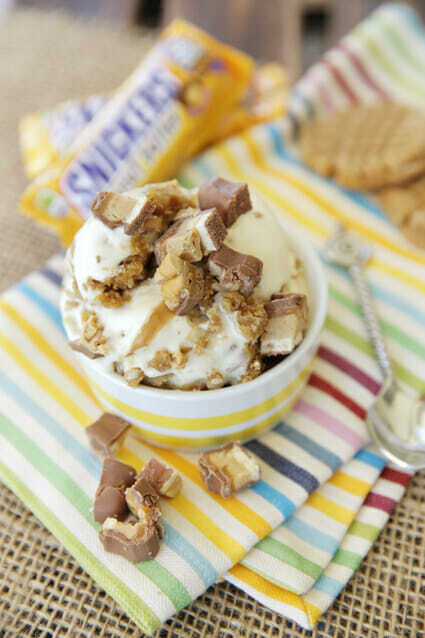 Cookies AND Snickers in the same ice cream (and they’re PEANUT BUTTER?)! I am in! Haha. Well coconut milk will never, ever be the same as cream and whole milk, in both taste and texture, so you’d just have to experiment and see. oh God this looks so good right now! Love anything peanut butter. Mouth = watering. Literally. Also, (smacks forehead). It kills me when people say things with good intentions that are just…incorrect. Of COURSE you have excellent little helpers! Boys like to cook just as much as girls do, and bravo to you for never limiting or excluding them from one of life’s great pleasures. Really great post. Just wanted to let you know that for months whenever I use the ‘save recipe’ icon for your recipes, it saves the Southwestern Brown Rice Salad to my Ziplist recipe box, no matter what recipe I’m trying to save. I’ve tried deleting my cookies but it must be a glitch with your site. Love your site and recipes (would love to be able to save them). That’s an issue with a third party app- I think we may just need to remove it, it causes too many problems! This looks amazing! I am looking for a new icecream maker. What kind do you use? Oh yum! 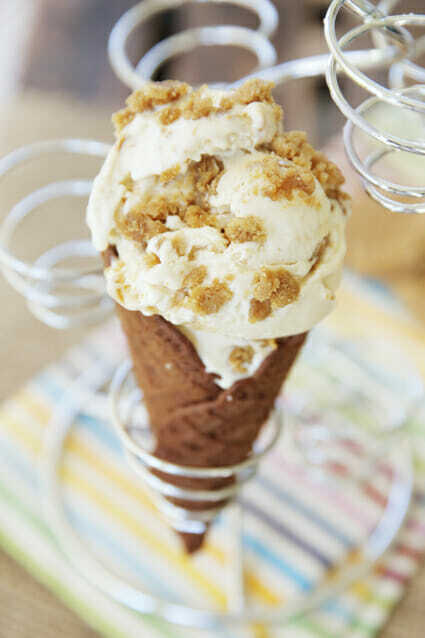 Another recipe to go and borrow Granny’s ice cream maker for! We made the old ” one ingredient” banana ” ice cream w/PB 2 and mini chocolate chips in the blender tonight. Did the trick but craving the ” real thing! I’ve never made ice cream before, but I’ve been wanting to make it for years. What is a good ice cream maker? Making it right now. How much salt? No salt. The peanut butter and cookies add enough, so that was just a typo. Oh my gosh there are so many wonderful things about this ice cream, I cannot handle not having it in front of me. This looks amazing! I can’t wait to try it because I love homemade ice cream! I’ve never tried making ice cream by cooking it but I made this recipe. However after chilling it for a few hours it turned from a thick liquid to a thick pudding-like mixture! What did I do? Sara, What kind of ice cream maker is that? Making it NOW! Is there an alternate recipe for making it with an ice cream maker?! Sounds delicious but I love my ice cream maker!! Love this recipe. One change I will make is to put all the ice cream ingredients, except maybe the peanut butter, in my Vitamix. Just turn it on and leave it for four or five minutes. No stirring, no cooked egg yolk pieces, just yummyness. You made me a custard-base ice cream convert. The added creaminess is so worth a bit of extra effort. Hubby loved this too and he’s not a peanut butter lover. Thanks for the recipe! I have 2 girls and a boy. My 5 year old boy is by far my biggest helper and the most creative in the kitchen. He always want to invent his “own” recipes. 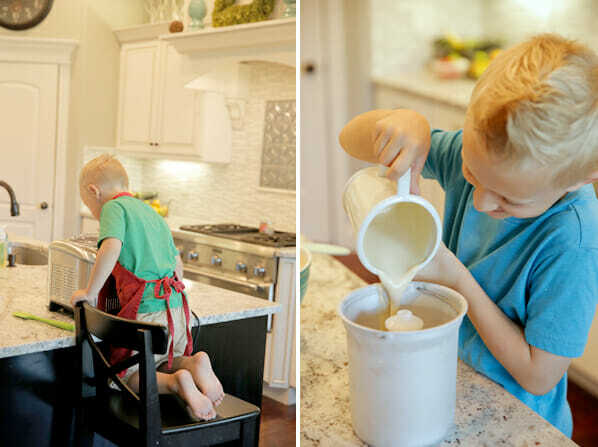 It is so much fun to create in the kitchen with that boy!!! Love them boys!! !